Look what I made for you today. Isn’t she pretty? I have always loved getting crabs. No, not those crabs. How ’bout y’all get your minds out of the gutter. Especially when I was younger, I loved going to seafood restaurants at the beach (Florida) and getting crab legs, crab claws, crab anything. There’s something about that anticipation that builds while you beat the hell out of their shells to get about a quarter ounce of succulent crab meat, then dunk it in warm melted butter. Then you do it again. And again. Until you’re…not full. But that’s what hush puppies, french fries and coleslaw are for, right? Oh, and cheese sticks. And sushi. Ok, anyway, one of the first things my husband told me when we were dating was, as much as he loves good food he refuses to “wrestle” it. That translates into no wings, no fried chicken, no shrimp-still-in-the-shell, and of course, no crab legs. Damnit…why doesn’t he like fun food? I would wrestle food all day long and take pictures of it. And, yes, most of the time I peel his shrimp for him. So spoiled. These are baby crab cakes on slider buns topped with guacamole and kiwi salsa. To make the salsa, combine all ingredients and toss. Same for guacamole. Store separately in airtight containers in refrigerator until ready to use. For the crab cakes, mix crab meat through lemon juice. Form into 12 (roughly) slider size patties, and put them in fridge while you prepare the pan. Heat a big drizzle of canola oil over medium high heat until hot. Add the sliders a few at a time, with plenty of room between them, and fry about 2-3 minutes on each side, until browned. 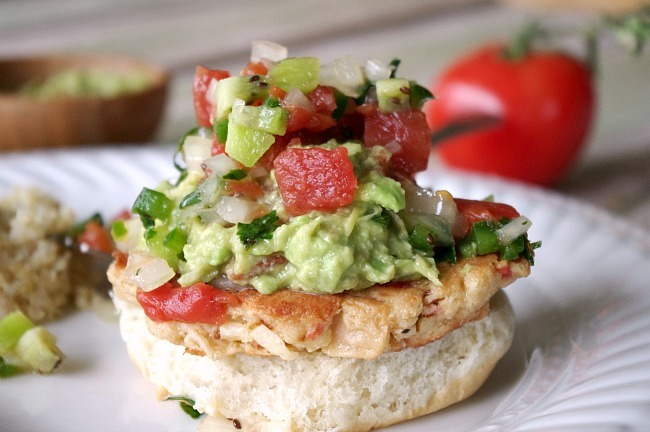 Add the crab cakes to bottoms of the buns, top with guacamole and salsa. You will not have to wrestle these; I promise.